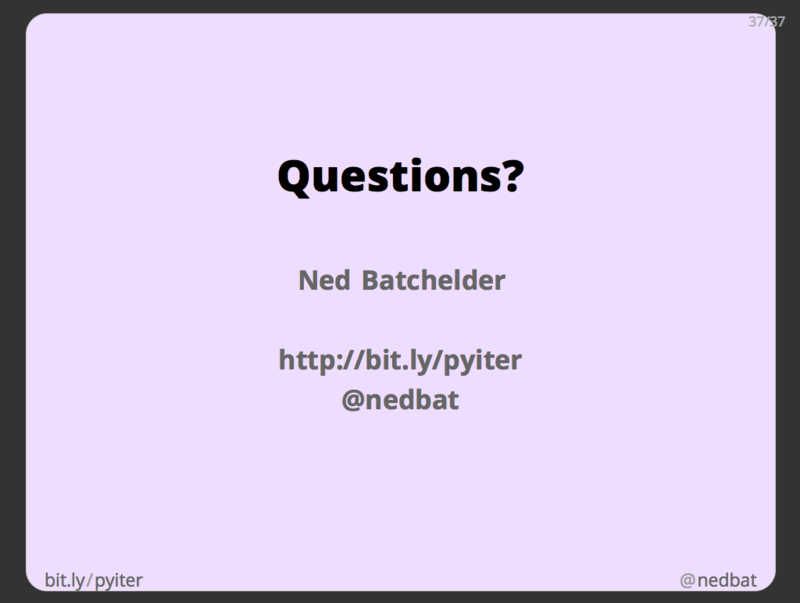 A talk for PyCon 2013. This talk is billed as Beginner, and sounds like a beginner topic, but I prefer to think of it as Fundamental. 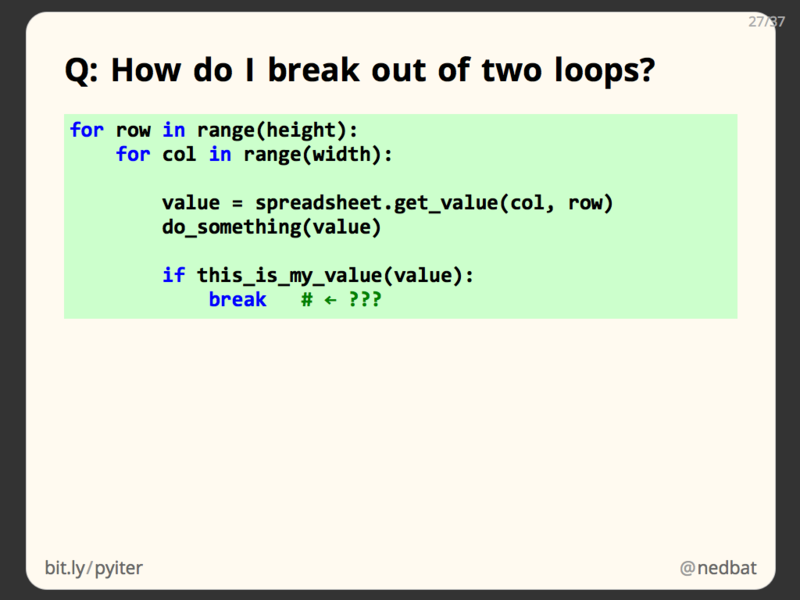 Plenty of expert Python programmers aren’t making enough use of the tools I’m going to talk about. Python has a nice model of abstract iteration which can be used to increase the expressiveness of your programs. Python’s iteration tools are one of the most underused features of the language, especially by programmers coming from other “similar” languages. My goal here is to show Python iteration in a light that would encourage programmers to explore more of its possibilities. All programs iterate over data, of various sorts. When using iteration, you should be as direct as you can, and you should use more abstractions to make your loops as clear and direct as you can. Let’s say you have a list of numbers, and you want to print each of them. One way to do it is shown in the first code sample: start a counter at zero, and as long as the counter is less than the length of the list, access that element of the list, and print it. Then increment the counter, and continue on to the next element. Eventually, the while loop will run over the whole list. This while loop works, and is a least common denominator: this way of thinking about the loop can be written in almost any language. C programmers coming to Python often end here: they are used to a loop that iterates over integers, and range() gives them a nice compact way to do it. Rather than iterating over indexes, and using the index i to get the value we really want from the list, we can simply loop over the values directly. The last code sample shows the right way to write this loop. “for v in my_list” gives us each value in my_list in the variable v, with no need to fiddle around with the index i at all. What started as a five-line while loop with two variables is now a two-line loop with only one. 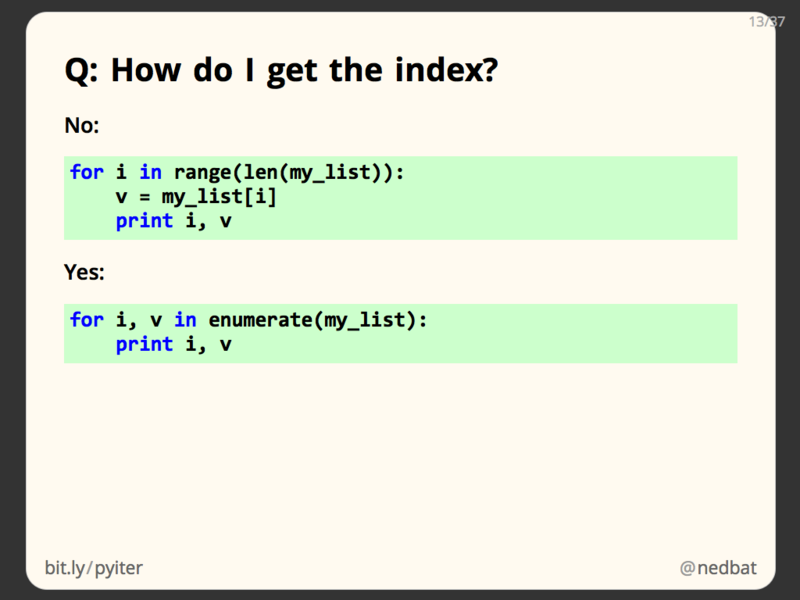 The for loop is Python’s versatile swiss-army-knife iteration tool. It can iterate over all sorts of Python objects. 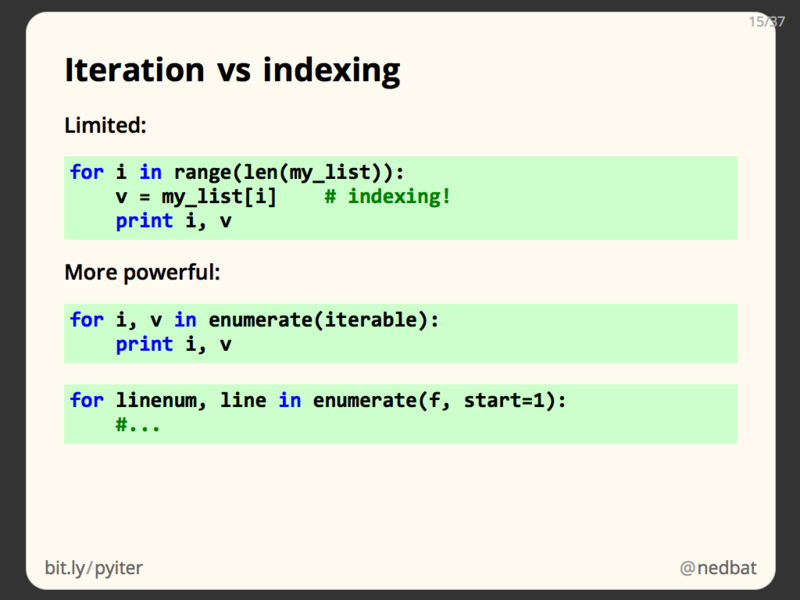 Any Python object can be “iterable,” which means it can provide a stream of values. Any iterable can be used in a for loop. The for loop extracts values from the stream, assigns them to the name, and execute the statements in the body once for each value. On the face of it, this seems simple. But this simplicity provides great power. The for loop can be used in all sorts of situations to iterate all sorts of values. And you can often re-shape your iterations to use the for loop more powerfully. 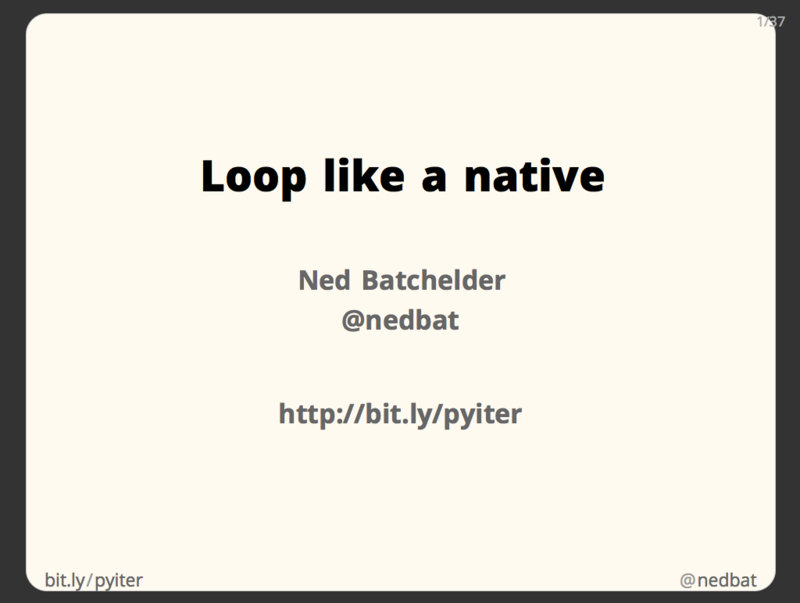 An iterable in Python is any value that can provide a stream of values. In our first example, the list of numbers was the iterable, but there are lots of other examples. There are many different iterable objects in Python, and each provides its stream of values in its own way. As we’ve seen, if you iterate a list, it will provide its elements in order. 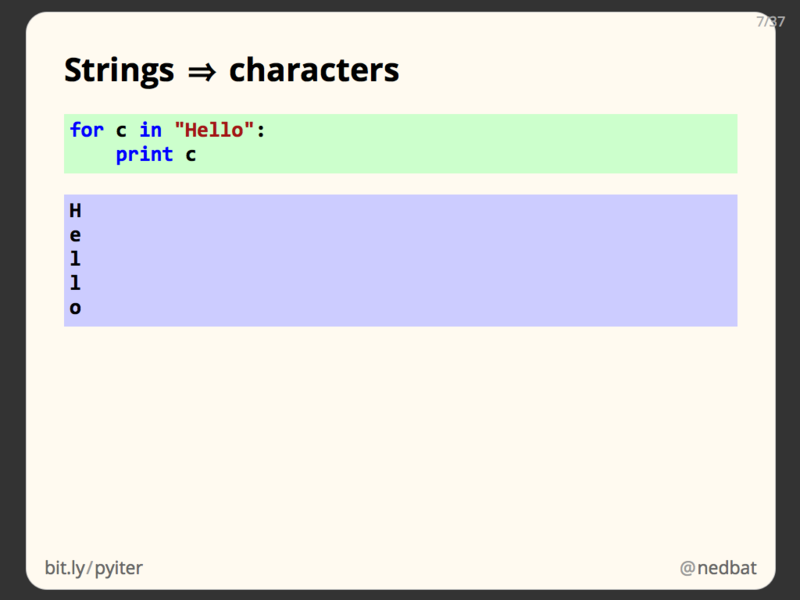 If you iterate a string, it will produce a stream of the characters in the string. If you iterate a dictionary, it will give you its keys. This might be a little surprising, what about the values? Dictionaries are best thought of as a container of keys, where each key also has a value associated with it. If you want, you can choose to use methods on the dictionary to iterate over its values, or over its key/value pairs. Notice that the keys appear in a surprising order. Dictionaries have no inherent order. When iterated, they produce their keys in an arbitrary order. Each iterable can decide the semantics of its sequence. Dictionaries promise to give you all of the keys, with no extras, and no duplicates, but make no guarantee about the order of the keys. This demonstrates an important point: iterating a value doesn’t mean you can index into it. 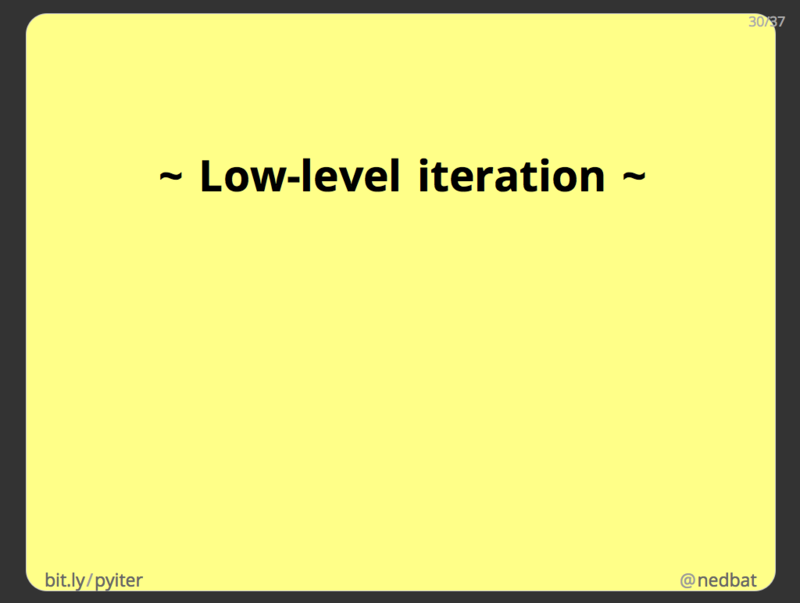 Iteration only knows how to get the next value, it can’t get the first, or the last, or the third-from-now. An open file is iterable, its values are strings, one for each line in the file. This is extremely convenient, since this is often the way text files are consumed, one line at a time. In this example I’ve printed repr(line) so you can see that the lines still have a newline at the end, every byte in the file is provided somewhere. The standard library provides a number of other examples of iterable values. The re module searches for a regex pattern in a string. 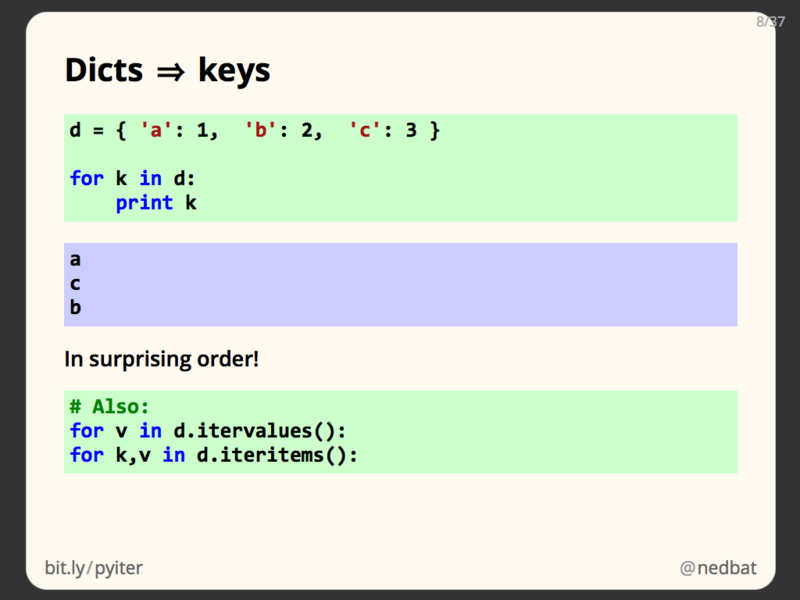 The finditer function takes a pattern and a string, and iterates over all the places that pattern matches that string. It’s a good way to process a number of pattern matches in a simple way. In the os module, the walk function takes a directory name, and iterates over all the subdirectories in that tree. This iterator is interesting because it’s working on a tree structure, but linearizing it by producing subdirectories one after the other. 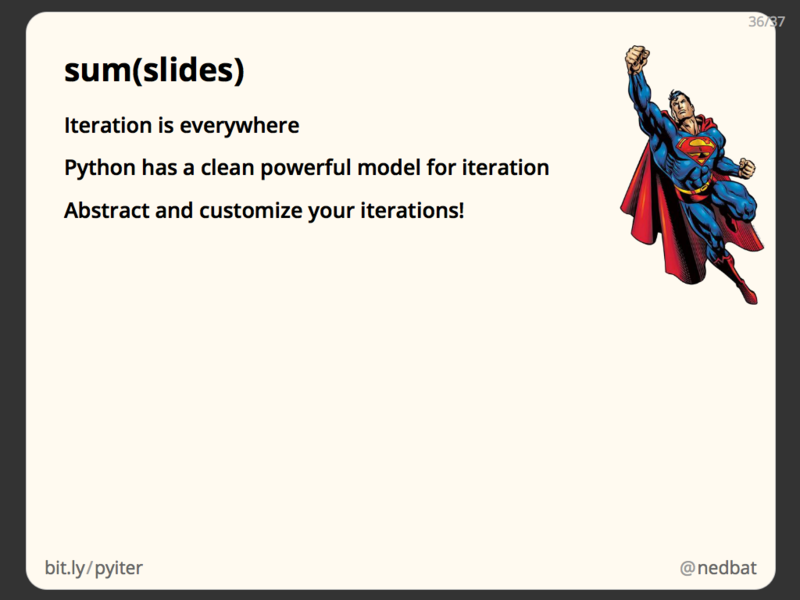 The itertools module provides dozens of tools for working with iteration. The count() function produces integers forever. Of course you’ll need some logic to decide when to end. These are just a few examples of using iterables to represent a variety of kinds of iteration, and doing it naturally without resorting to index variables. 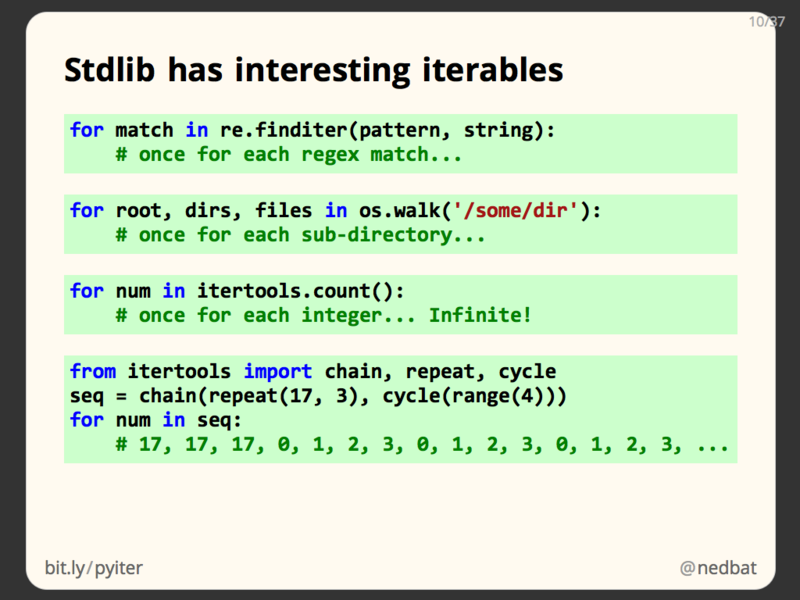 In addition to provide lot of interesting iterable values, Python also uses iterables in lots of places, not just in for loops. Here are a few examples. The list() function creates a list using the values it gets from its iterable argument. Keep in mind, the argument can be any iterable. list(my_dict) will produce a list of the dictionary’s keys. list(my_open_file) will produce a list of the lines of the file, and so on. List comprehensions are a concise way to create a list using a computation on an iterable. They are very powerful, but are outside the scope of this presentation. Here we make a list of the values returned by f for each value in the iterable. The sum() function takes an iterable, and returns the sum of all the values it finds. The iterable has to be a stream of things that can be added. The min() function takes an iterable of comparable values (such as strings or numbers), and returns the smallest value in the stream. Of course there is a max() function as well, which returns the largest value. The join method on a string takes a stream of strings, and joins them all together into one long string. 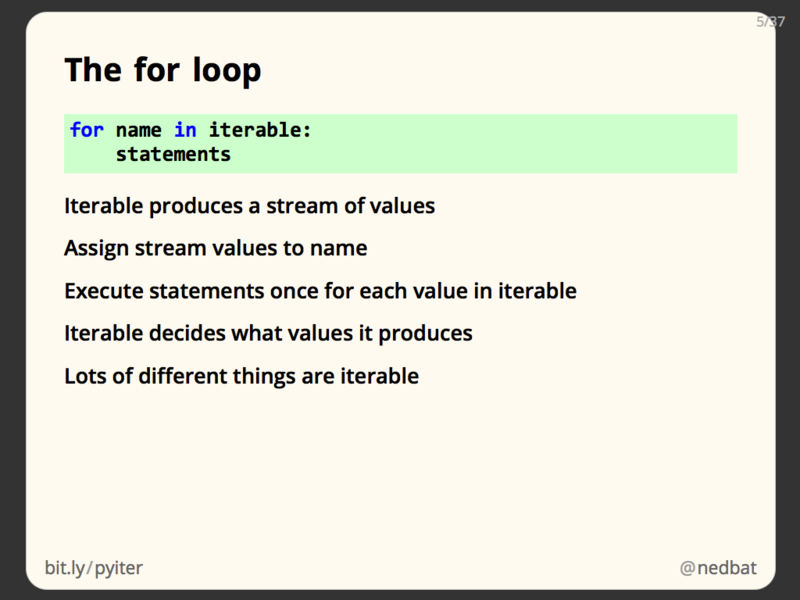 These are just a few examples of using iterables outside of for loops, as streams of values that can be passed to functions, computed with, and so on. 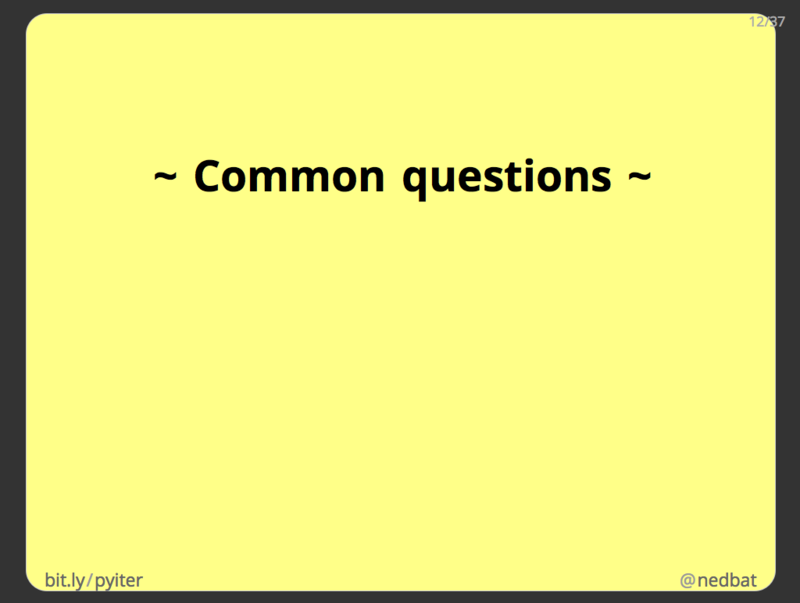 When learning about Python’s iteration, there are common questions that keep coming up. Let’s look at a few. OK, back to our list of numbers. We know now that we can iterate it directly, without need for Rube Goldberg integers. But sometimes you really need the index. Perhaps you just want to print the values with their position. Some will go back to the range(len()) twistiness, but there’s a better way. The second code example shows how to use the enumerate() function to get two values at each iteration: i is the index of the value, and v is the value. Now we can print the value with its index, again without resorting to iterating over integers. In addition to looping over iterables, you can manipulate iterables to produce new iterables that might be more convenient for you. 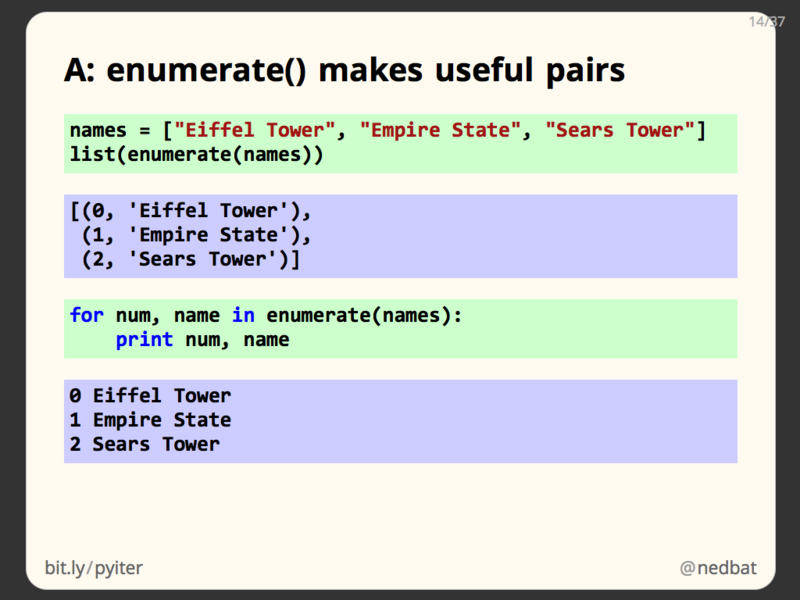 The built-in enumerate() function takes one iterable, and produces a stream of pairs. Each value from the iterable is paired with a number, starting with zero. In our example, the list “names” is given to enumerate() which iterates the list, giving the values “Eiffel Tower”, “Empire State”, “Sears Tower”. It pairs those with the number 0, 1, 2, to produce a stream of pairs. 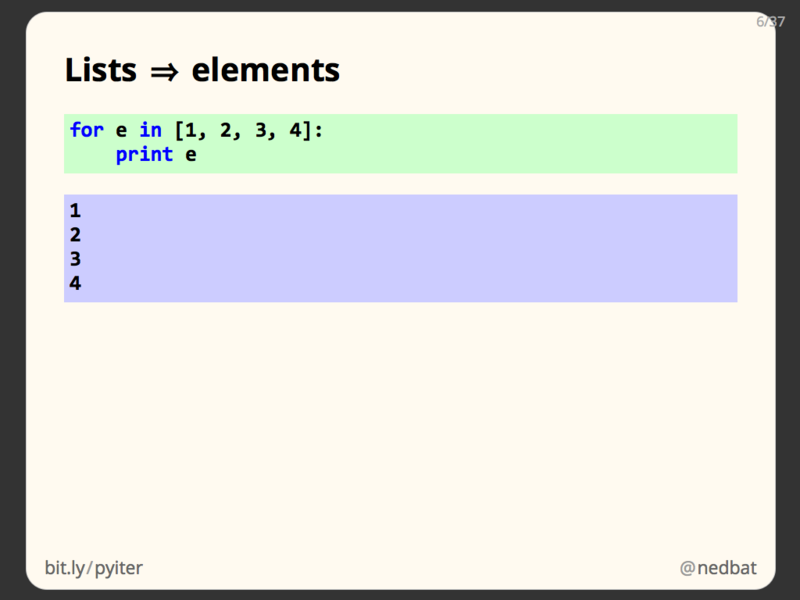 In the first code sample, we use list() to make a list of all the values enumerate() produces. This gives us a list of pairs. We can use multiple-name assignment to get those pairs as two separate values, as in the bottom example. The variables num and name are assigned to the number of each name, and the name itself, from the list “names”. This is a convenient way to iterate over the values in a stream while also using their index. An important advantage to the enumerate style of numbering: it works with any iterable. When iterating over integers, you need the second Rube Goldberg step of indexing into the iterable with the index. Many iterables don’t support this operation. You can’t index an open file to get the 100th line, for example. The enumerate() technique works with any iterable, and so is much more powerful, in addition to being more compact and direct. By the way, another common style of getting the index of an iterable is show here: keep a separate counter, and increment it to keep it in step with the enumeration. This is just a goofy sidecar bolted on the side of your loop. It works, but adds extra complexity. If the loop is more complex than shown here, it is easy for it to become long enough that the index increment gets lost. It’s much better to keep the loop simple. Fewer moving parts mean fewer bugs. The integer way is to again loop over a range of integers, and then use list indexing on the two lists to get the corresponding values. But again, there’s no need to resort to integers. The zip() built-in function takes a pair of streams, and “zips” them together to produce a stream of pairs. In this example, we have two lists: “names” has names in it, and “heights” has heights that go with each name. zip(names, heights) will produce a stream of pairs, each pairing a name with the corresponding height. Using multiple assignment, we unpack the pairs into the variables name and height. Notice again that because we don’t rely on list indexing, zip() can work with arbitrary iterables, not just lists. Here’s another example of the power of iterables. The dict() function will accept a stream of key/value pairs, and construct a dictionary from them. 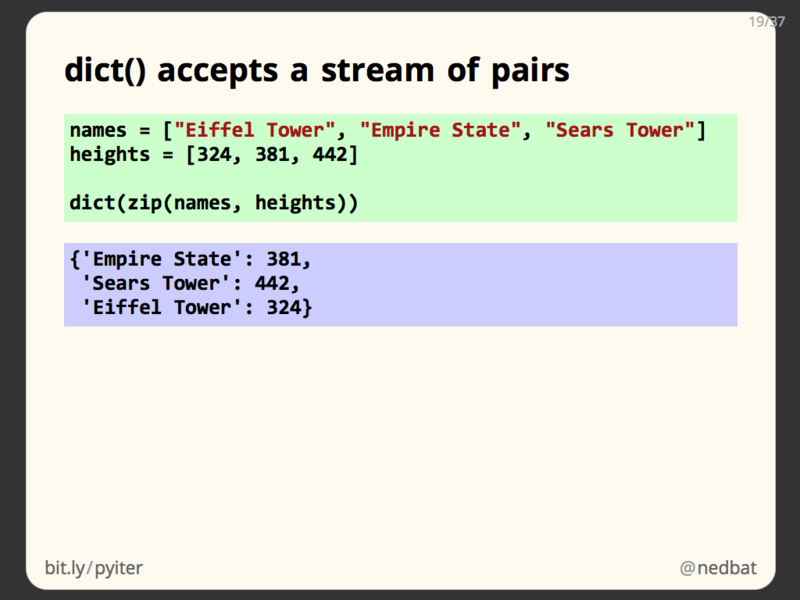 If we have two parallel lists, “names” containing strings, and “heights” containing numbers, zip(names, heights) will produce a stream of pairs, and dict() will use that stream, and produce exactly the dictionary we want. One last example of the power of iteration. Suppose we’ve made our dictionary of buildings and their heights. We can use a few different uses of the max() function to find the greatest height, the name and height of the tallest landmark, or just the name. A great deal of power can be packed into a concise expression. 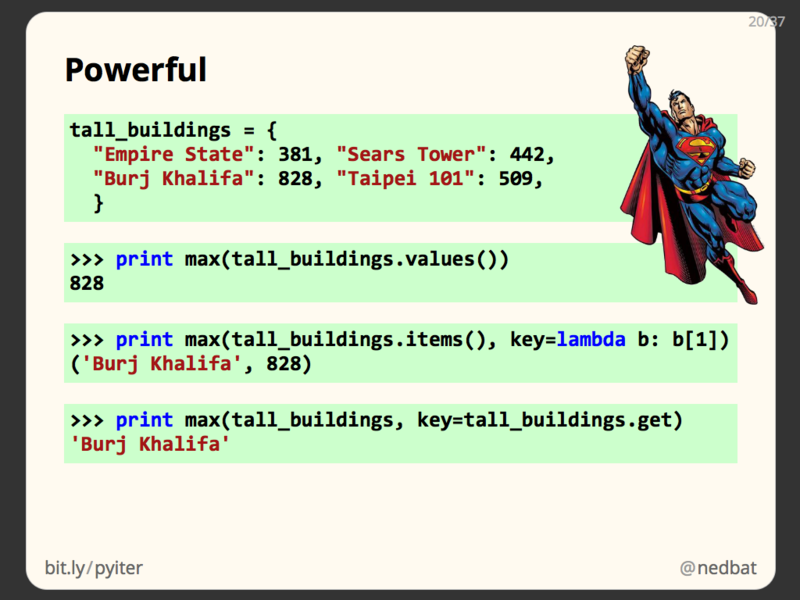 Python’s iteration primitives give you the power to loop over tall_buildings in a single bound! 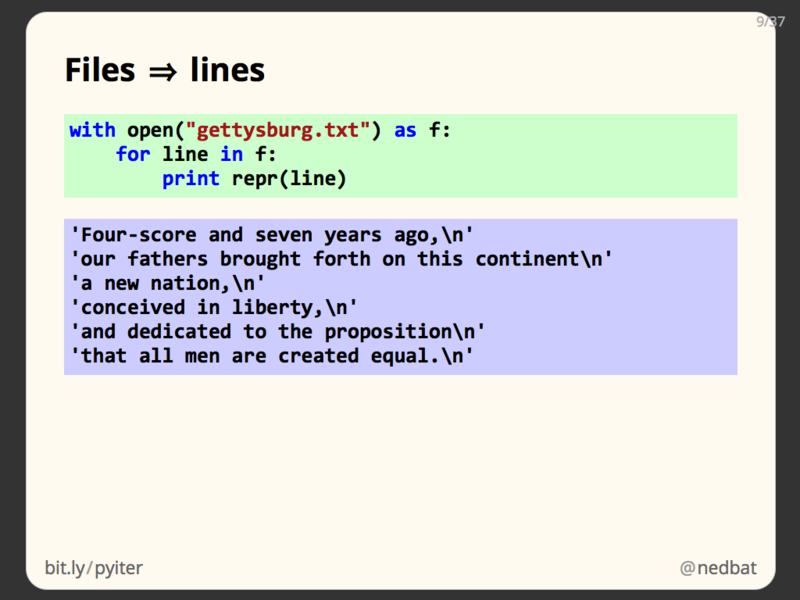 We’ve seen the power of Python’s iteration primitives. 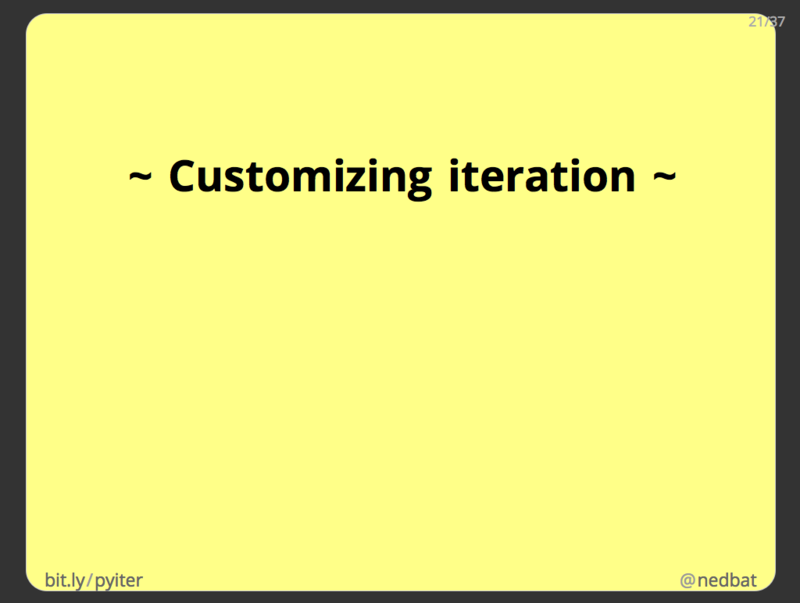 Let’s talk about ways to customize your iterations. Another style of indirect iteration is iterating over a sequence but picking and choosing among the items. Here we have a list of numbers, and we want to do_something() with the even ones. In first code example, we loop over the numbers, and test each to see if it is even. Only if it is, do we perform our action. An alternative is to write a function that accepts a sequence, and produces the new sequence we want. The evens() function does this. It iterates over its argument, making a list of the even values. Then we can use it in our for loop to iterate over the even numbers directly. This example has a problem, namely, that is makes an actual list of the even values. We’ll see in a bit how to avoid this. In this case, the test for an even number in the loop isn’t burdensome, but this is a toy example. If the test were more complicated, or if it had to be performed in many places, it would be a clear win to abstract the selection into a function like evens(). By writing evens(), we’re abstracting our iteration, and creating new sequences to iterate over. 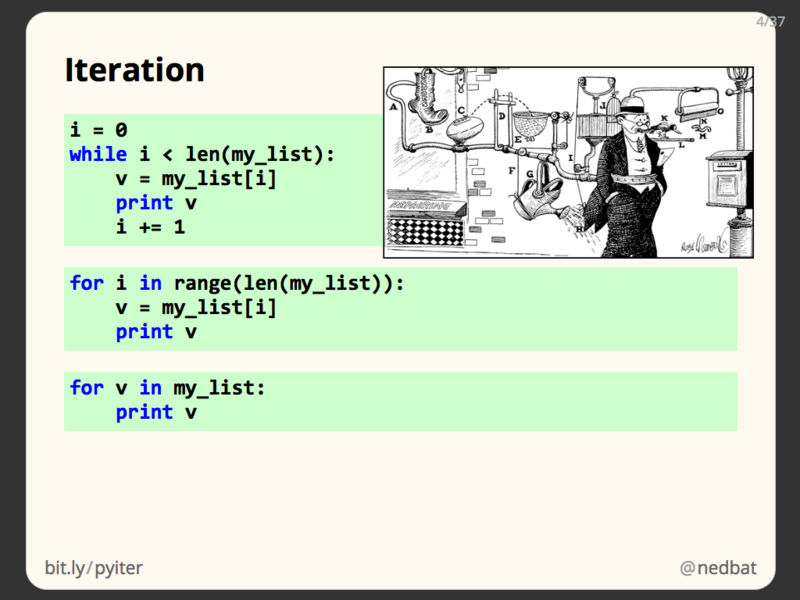 Generators are a way to create your own iterables by writing a function. A normal function returns one value, with the return statement. 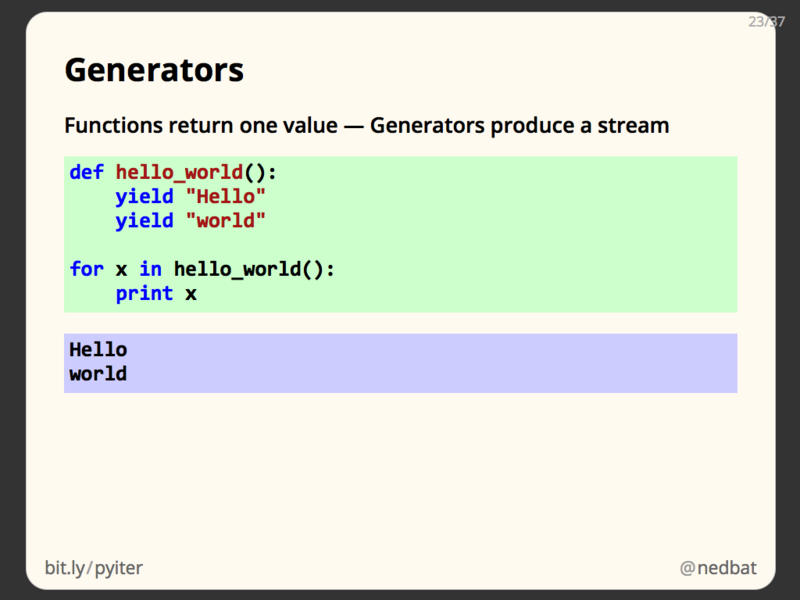 A generator looks just like a function, but instead of a return statement, it has one or more yield statements. Calling the generator function creates an iterable, and iterating it runs the code in the function. Each yield statement executed produces another value in the stream. Here’s a toy example of a generator, just containing two yield statements. If you iterate it with a for loop, you can see that hello_world() produced a stream of two values, “Hello”, and “world”. Real generators are not this simple, typically the body of the function would itself have a loop, with yield statements within it. 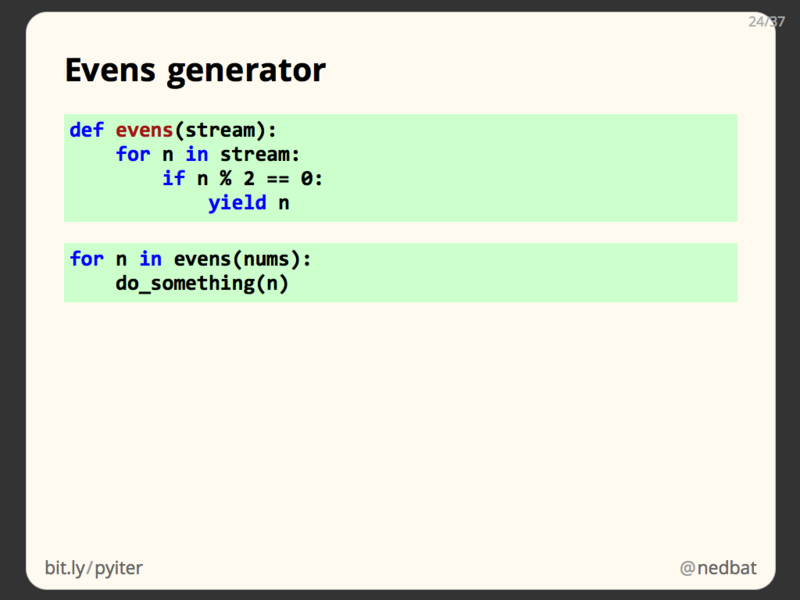 We can re-write our evens() function as a generator. The code is almost the same, but instead of building a list and returning it at the end of the function, we simply yield the values as we find them. We use it the same way: call evens(), passing it the iterable we want it to work on, and it returns an iterator that will produce the even values from it. The old evens function made a list, and returned the entire list as its only value. That meant that nothing would happen in the caller until evens() had examined the entire iterable sequence and stored all the even values. For small inputs, that might be fine. Our evens() generator will yield the first even number it finds, letting the caller do work before the whole sequence is examined. Note this means it can work on indefinite or even infinite streams. Generators have the advantage that they are lazy: they do no work until the first value is requested, and they only do enough work to produce that value. Work after that doesn’t happen until the next value is requested. This makes them use fewer resources, and usable on more kinds of iterables. Generators can be confusing. They look very similar to functions, but have very important differences. First, calling the generator doesn’t immediately begin running the code in the generator, it simply creates an iterable. When the for loop or other consumer of the iterable starts pulling values from the stream, then the code in the generator begins executing. When a yield statement is encountered, execution is suspended, and the value is used as the next value in the stream. With a regular function, a return statement ends the function for good. But with a generator, the current state of the execution is remembered. When the next value is requested from the iterable, execution continues in the generator where it left off, after the yield statement. The next value in the stream is produced when a yield statement is executed again. All the local variables in the generator retain their values for the whole course of the stream. 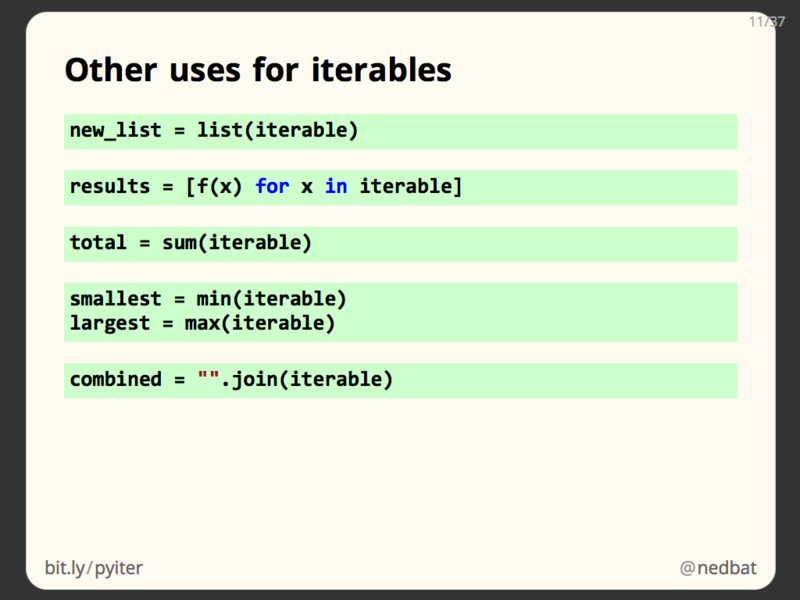 This makes it a very convenient way to write iterables. The iterator finally ends when the generator returns, either with an explicit return statement, or by executing the last statement in the generator. 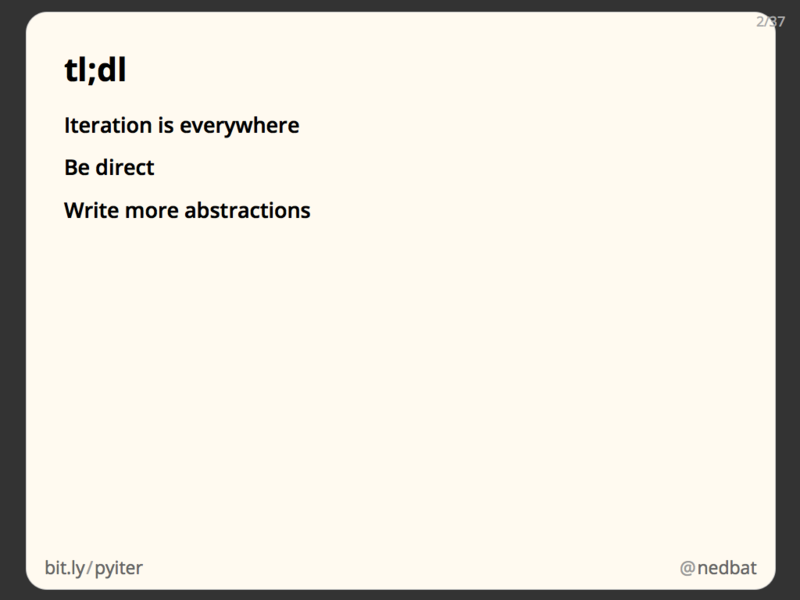 With generators, we have a very powerful tool for abstracting iteration. Just as functions are great for abstracting a series of statements, and classes are great for abstracting a collection of data and the methods that operate on it, generators are great for abstracting iteration. As a real-world example, consider a program that reads a text file and acts on the lines in it. Our file can have comments, which are lines starting with ‘#’, and can also have blank lines, both of which should be ignored. Here’s a sketch of the program. We open the file, then loop over the lines in the file. We strip the whitespace from the ends of the line, then consider whether the line starts with ‘#’. If it does, we continue the loop, which skips this line of text and goes on to the next line in the file. Similarly, if the line is blank, we continue to the next line in the file. Finally, if the line isn’t a comment or blank, then we process it in whatever way we like. When all of the logic is considered, this loop calls do_something() on all of the non-blank non-comment lines from the file. Our line-processing program works just fine, but it mixed together two concerns. The first is, what are the interesting lines in the file, and which should be ignored? Second, what should we do with the interesting lines? These two questions may have nothing to do with each other. You may need to re-use the first, for example, in a larger program that processes a few different kinds of text files. Using a generator, we can split this loop into two parts. The first part, which lines are interesting, can be implemented as a generator. 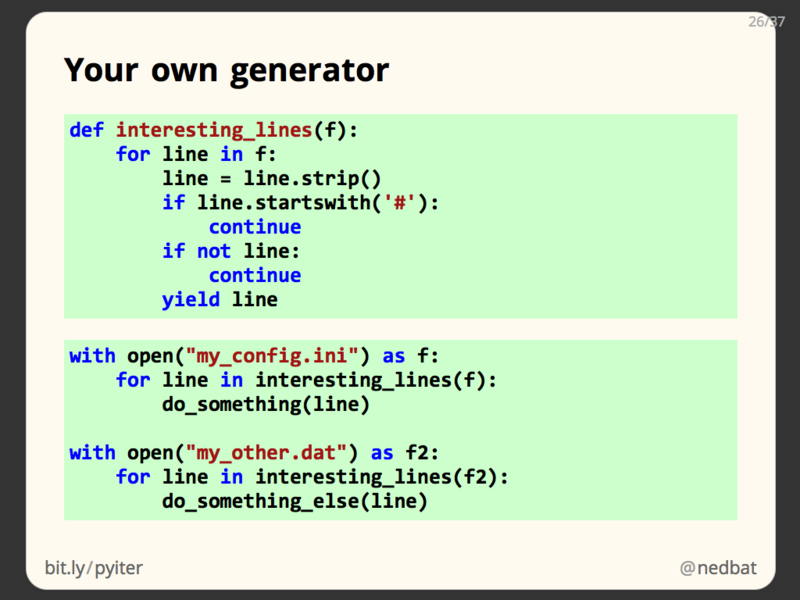 Our interesting_lines() generator takes an open file and loops over its lines. It uses the same code as before to skip over comment or blank lines, but then instead of processing the interesting line, it simply yields it. Now we can use interesting_lines(f) in a for loop, and the loop will only see the interesting lines, all the uninteresting stuff has been skipped in the generator. This makes it easy for us to reuse the line-skipping logic in other loops. Notice that our generator interesting_lines() is actually a pure filter: it accepts a line-producing iterable of any sort, it doesn’t have to be an open file. And it produces a stream of lines, by picking the ones it likes from the input stream. Notice also that we have re-thought our iteration: in the original code, we were iterating over all the lines in the file, and “manually” skipping over the uninteresting ones. With our new generator, we can think instead of iterating over the interesting lines in the file. This lets us work at a higher level of abstraction. As a last example of rethinking iteration, consider looping over a two-dimensional structure like a spreadsheet. 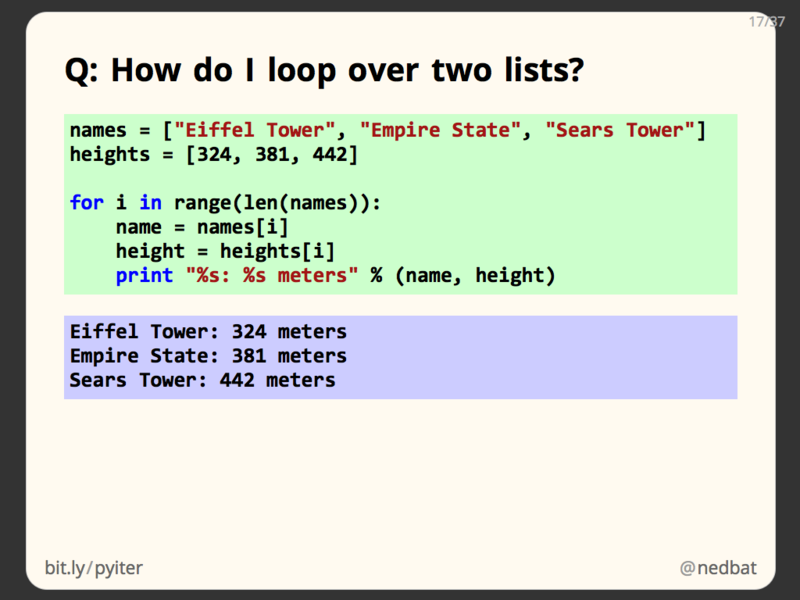 A simple way to do it is to use two nested loops: the first loops over the rows, and the second loops over the columns. Together the two loop variables can be used to access a cell in the spreadsheet. There’s a problem with this, though: suppose we are checking the cells for some condition, and when we find the condition, we want to stop looking through cells. There’s no nice way to break out of two loops at once. The break statement shown here will only break out of the column loop, and will leave the row loop untouched, so the search will continue from the beginning of the next row. 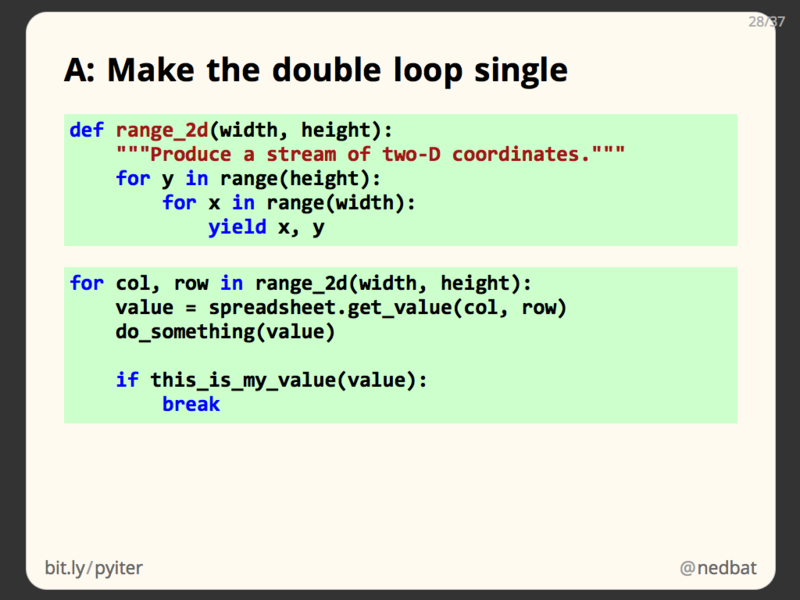 There are ways to write the code so that both loops will end, but they are messy and confusing. A more interesting solution is to change the iteration by abstracting away the two-dimensional nature. Here we have a generator called range_2d(): it takes a width and height, and produces a stream of pairs (x,y) that range over the entire 2D space of coordinates. It does this using the same double-nested loop we had before, but now the loop body simply yields the tuple we need to represent the coordinates. Our main loop now changes from a doubly-nested loop to a regular single loop. Each iteration of range_2d() produces another coordinate pair, and we can process the coordinates just as we did before, except now when we’ve found the cell we want, we can just break out of the loop, and all is well. This is a more unusual loop change than we’ve seen before. Here we changed a double loop into a single loop by re-thinking what we were iterating over. This is a better loop because it matches our own way of describing the loop. No one would describe looking for a value in a cell by saying, “once for each row, look at every cell in the row,” which is the English equivalent of our double loop. Instead, you’d say, “look at every cell in the spreadsheet,” which is what our new loop says. Our generator lets us define “look at every cell” abstractly so that our main program can use the most expressive way to get the job done. 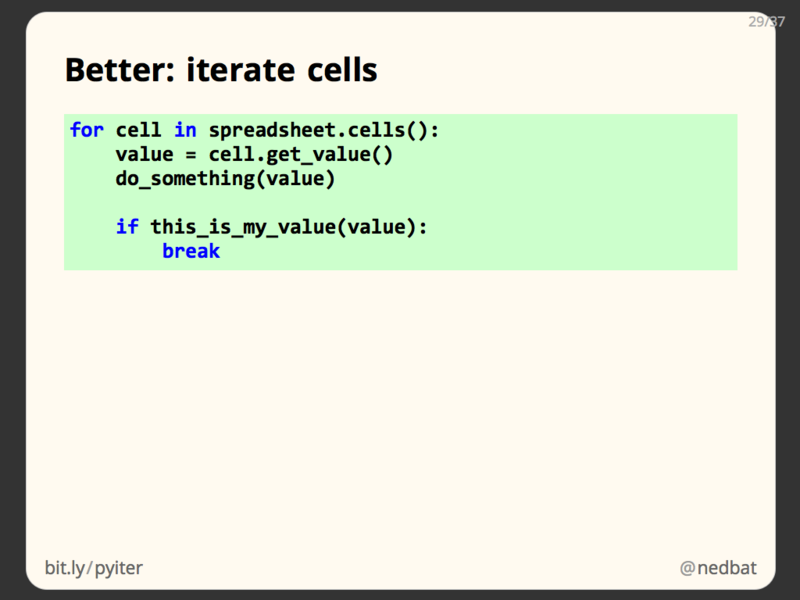 An even better solution would be for the spreadsheet to have a .cells() method that provided an iterator over all cells. Notice our range_2d solution still meant talking about integers, though they were pairs of integers. Iterating over pairs of integers when we really want to be iterating over cells is just another form of Rube Goldberg thinking. Much better is to add custom methods to compound objects that let you iterate directly over the values you’re interested in. Before we talk about how to make your objects iterable, a quick word about the low-level mechanics of iteration. There are really two kinds of objects involved in iteration you need to know about. 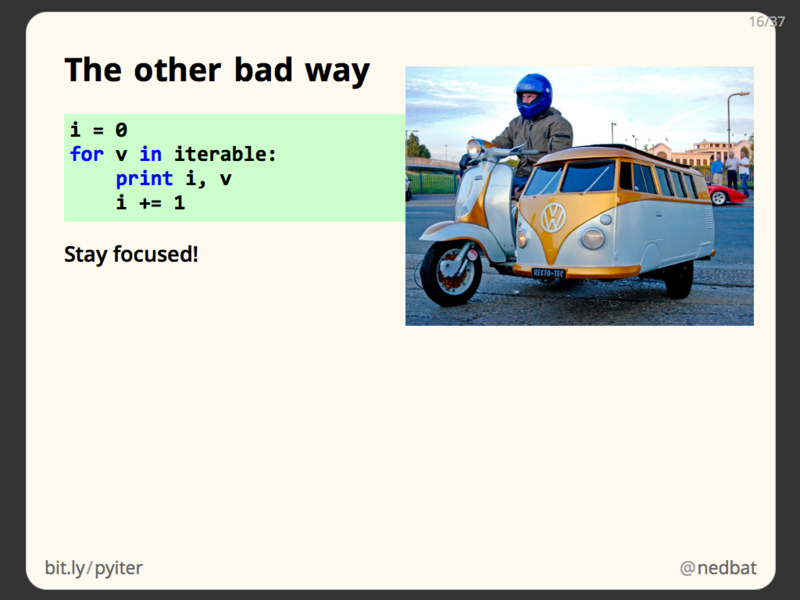 We’ve been talking about iterables, which are objects that consist of a number of values. They can’t actually be looped over directly, to do that, we ask an iterable for an iterator. You can think of an iterable as an object with values in a sequence, and an iterator as the current position within that sequence. For example, the pages in a book are iterable, and the bookmark is the iterator. The important operation on an iterable is iter(), which will return an iterator. And the only operation available on an iterator is next(), which either returns the next value, or raises StopIteration, a special exception that means the iteration is finished. 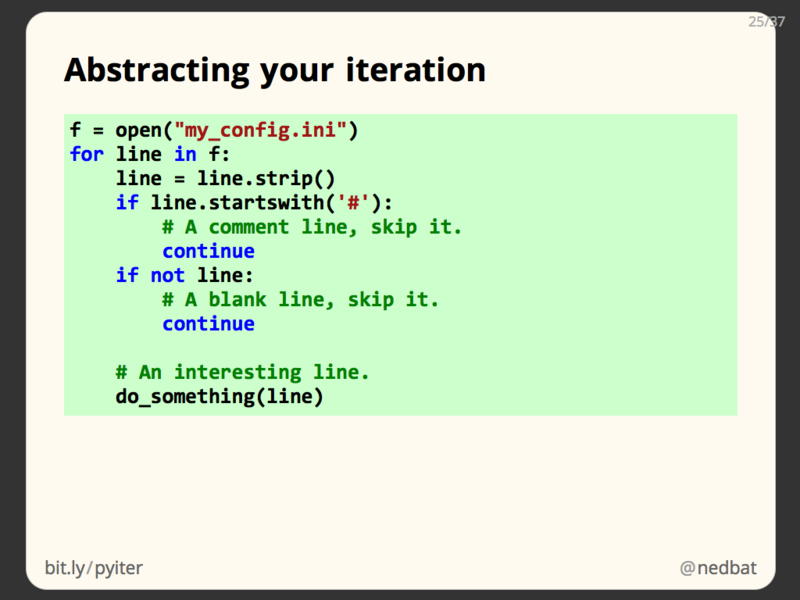 Iterators having only one operation is important, because it means Python’s iteration mechanism can be applied to as broad a range of data as possible. You can’t ask if there will be a next value, you can’t skip ahead values, you can’t rewind the stream, you can’t ask what the last value was, and so on and so on. All you can do is ask for the next value, and you’ll either get one, or you’ll get a StopIteration exception. 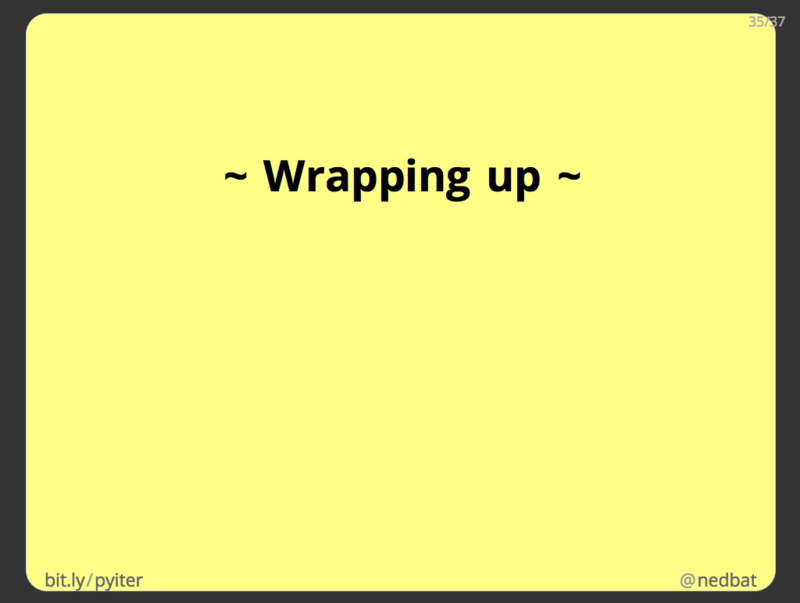 Some iterables provide more operations, but the only one that is guaranteed is next(). With the low-level next() operation, we can use iterables in other ways than just looping over them entirely. For example, with an open file, we can read the first line with next(), then use a for loop to read the rest of the file. Notice the for loop doesn’t re-read the first line in the file. An open file object is an iterator, it knows where it is in the file, and pulling values from it will give you the next line at the current position. The ultimate way to abstract your iterations is to make your own objects iterable. By implementing the special method __iter__, your object is iterable. All __iter__ has to do is return an iterator of some kind. The simplest way to do that is to use the iter() function on some collection you have. 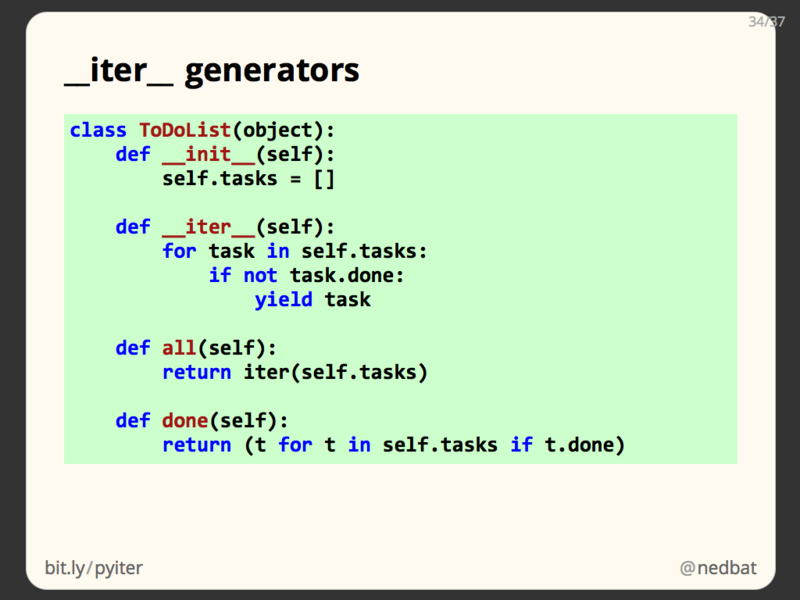 Here we have a self.tasks list, and our __iter__ can simply return iter(self.tasks). Once we do that, our object can be iterated just like any other Python value. Here we use it in a for loop, but it can also be used in all the other ways iterators can. A more powerful way to write __iter__ is to use a generator. Remember that calling a generator returns an iterator, just what __iter__ has to do. Here we’ve changed our to-do list to only produce the not-done tasks when it’s iterated. Remember that your object can be iterable in more than one way. 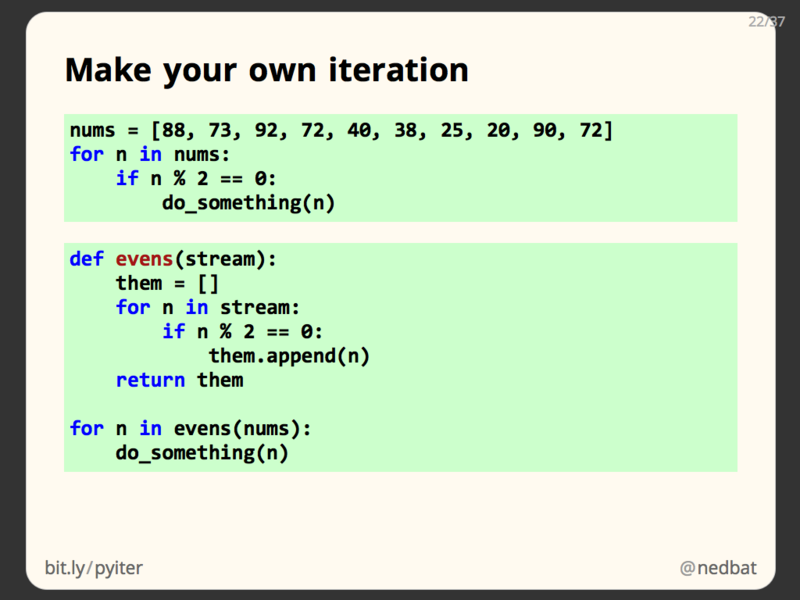 You can have methods that produce iterators as well. Here our to-do list has an .all() method that returns all the tasks, simply by returning an iterator from the self.tasks list. The .done() method returns the done tasks, using a feature we haven’t seen yet, a generator expression. I used three different techniques for these three iterator methods, just as a demonstration of a range of possibilities. The power here is in providing customized iteration using all the tools Python gives us. The “iterator protocol” is the actual sequence of function and method calls that happen to create and consume iterables. It can be useful for advanced uses of iterables. When you define a class, you can make it iterable by defining a __iter__() method. List comprehensions are a compact way to describe a list in terms of a computation over another iterable. They can make your code very concise. Generator expressions are a lot like list comprehensions, but generate values on demand, like generators. 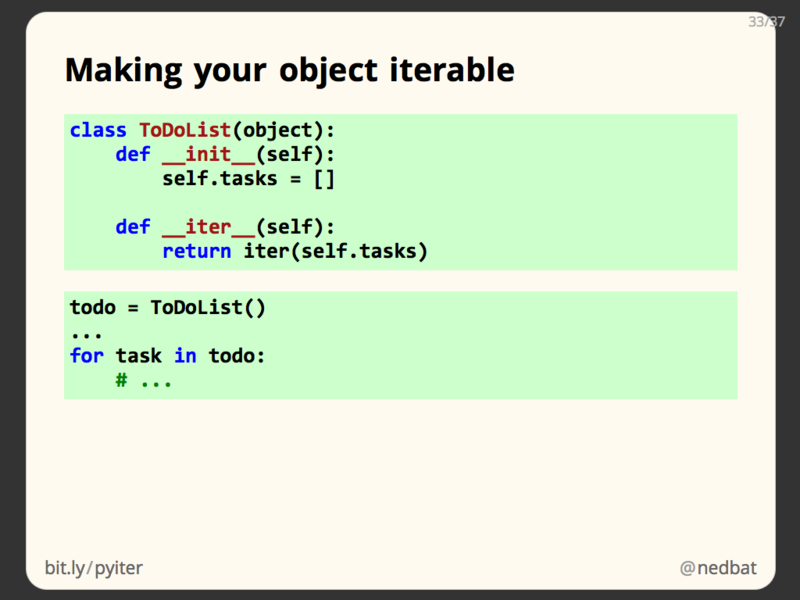 itertools is a module in the Python standard library full of functions for creating, manipulating, and consuming iterables. 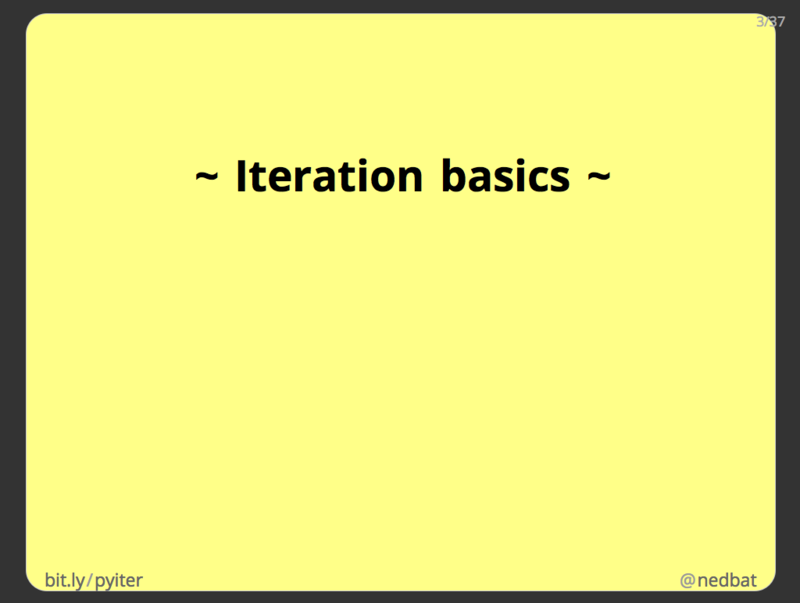 Iteration is a fundamental tool in all programming. Python has a simple yet powerful model for iteration that is used throughout the language and standard library. Using the tool that iterables provide, you can re-think your iterations to make them clearer, more concise, and more powerful. Once you start using these tools and ideas, you’ll feel like you have superpowers too! By far, the clearest tutorials on iterators and generators! kudos to this! I found this very helpful. We iterate all the time! this is what i called article !! well written ! thank you! This is the third time I've read all the way through this, and I love it so much. This is probably the absolute best Python iteration explanation I've seen anywhere, with little room left for improvement. Kudos! You mentioned you left out 3 slides in the video, anyway we can get those 3 slides? Another great iterating trick I learned recently was.. This revelation has allowed me to get rid of almost all of my while True blocks. I can turn virtually anything into an iterator without having to rewrite the underlying code. One question: what technique did you use for your slides? Especially the highlighting of the currently discussed code line is a great feature (dark green on you light green code)! 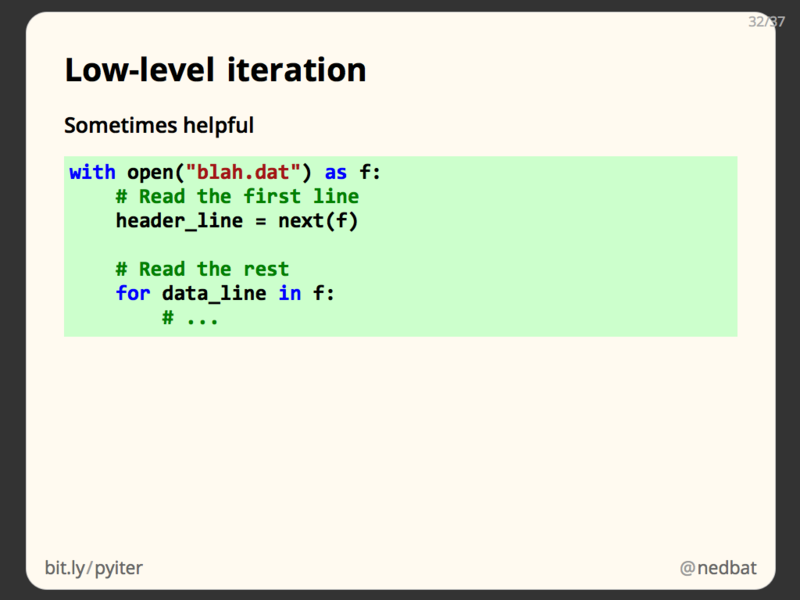 I examined your html, but did not get the clue, because this highlighting seems not to work on your online slides. Great talk! I am using Python for some tools, but still in a very 'unpythonic' way. Your clean, fast hints really helped me to understand iterators better AND to better memorize how generators work (I forget it all the time if not used weekly...). Inspiring talk (not limited to the content itself), thank you! I looked a bit closer and see that you are using slippyJS and your own 'Lineselect jQuery plugin'. The highlighting works if I click on a line, and if I press the keys G,J,K,X,. (saw it in your code). I just wonder why you assigned these keys for your presentation...? Anyway, now at least I know how it works. I'm new to Python and this tutorial couldn't be more clear..thank you very much! Classes, generators, and iterators changed the way I looked at programming. One related topic I haven't found to be well-discussed is sequences. As I understand it, the sequence protocol consists of defining/overriding __len__ and __getitem__ for a class. This allows indexing/subscripting a class, but more importantly allows the class to be used in a for/in loop. As I understand it the sequence protocol is now largely obsolete, having been replaced by the more flexible, expressive, and generator-friendly iterator protocol described herein. This is a great write up. I am iterating through a bunch of csv files. I read a file in and write it out with a new name. Within each file, the first few rows are key, value pairs. The header of each file starts on row 12. I am taking row 5 key and appending it to the header. I fill the resulting column with the row 5 value. The only problem is that when I am finished 'looping' through the file, there is a new row added that contains only the row 5 value. How do I stop it? 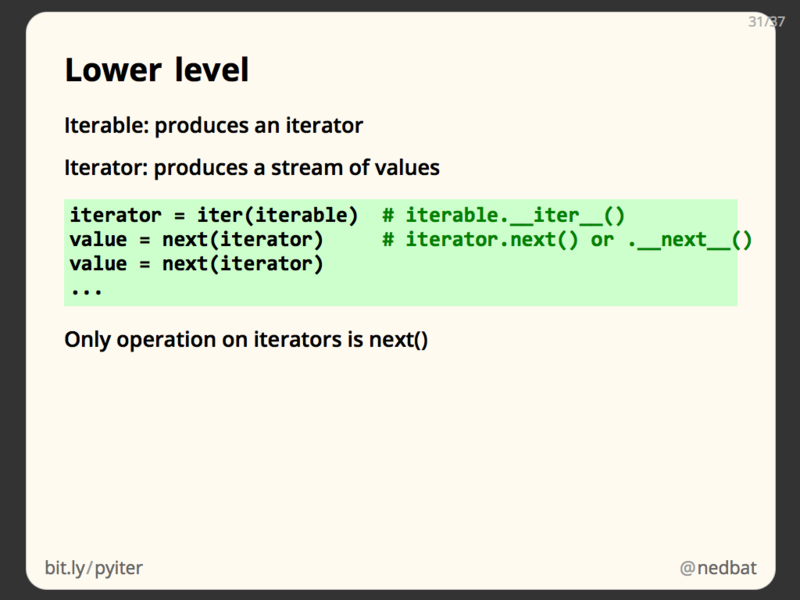 Excellent discussion of iterables, iterators, and generators! Thanks! Thank for your time and effort. I am trying to run some very simple code using os.walk with frustrating results. The code is so basic yet can't get it to work. I would like it to start on the C:/ drive listing every file with along with the path to the file, onto the screen. Please understand I am reviewing your talk and not yet reaped the benefits of the discussion. From the code it is obvious my first problem had UnicodeEncodeError and using the try and except allowed me to get around that. The second error pops up as a gui dialog box in window 8.1 (running python 3.6.1) Have typed in the contents of the Application-Error box that has splashed up on my screen. If you can help me understand why the short little script just can't finish it would be great. (0x80000003) occurred in the application at location 0x625fdbb2. I learnt lots of good information about `yield`.